Israeli inventors enamored with 1960's science fiction hit Star Trek have created a food "replicator" that creates meals in 30 seconds. "The dish can be anything, it can be a meal like chicken with rice, like couscous with vegetable or an amazing Ramen or even a chocolate soufflé or any other desert that you want," Carasso explains. Meals are prepared in 140 gram portions in a recyclable container. At the push of a button on Genie's mobile application, the device begins mixing, shaking and adding any required liquids from tubes attached to the back of the compact machine which bakes or cooks the desired dish at the appropriate temperature. They describe the idea as a real life version of Star Trek's 'replicator', a device used to synthesize meals on demand, on board the mythical starship. 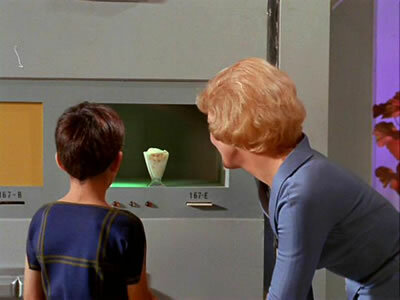 Children of the Sixties of course remember the cool food synthesizer from Star Trek: TOS. You had to pick the card you wanted, rather than choosing with an app.